The orc quarter was nestled right up against the northern wall of the city. Like many minority enclaves, it was small and cramped, with buildings not in the finest repair. Unlike many enclaves however, it did manage to be relatively clean and safe. The orcs were a naturally tight-knit group, and recidivists did not last long there. Most people weren't dumb enough to attack orcs for a few paltry coins. Crom's house was on the edge of the quarter, a modest two room affair surrounded by a small garden under the shade of the great oak. Crom was just outside, bidding farewell to Zok and Gorta's children. They had come for their lessons, and while the two boys were good lads, the real jewel was the girl. She would be a shaman one day, if he had anything to say about it. He stood outside to watch them walk back to their parent's house then retreated into his. He was tired, and so he washed himself with water he had boiled while the children were there, and a bar of rough soap he had been given as payment for a charm he had made for one of the humans of the city. When he had washed he performed his evening ritual and went to bed. The moon was high and Crom slept soundly. His dreams were of the misted realm of Ralaeth, it seemed as if his god called to him, but he could not find the way. A loud and fast banging on his door awoke him with a start. He pulled himself out of bed and pulled a black robe over his head. He groggily answered the door to see young Bora, little sister of Zala out of breath and frantic. Mokh Crom! You must come! We need you! Zala is hurt they said! Crom said nothing, merely grabbing his hat, broad belt, medicine bag and totem-axe and following her out. They moved swiftly and arrived at the home in question in ten minutes. He burst in and eschewed the traditional greetings. "Where is she? What happened?" Zala's mother, Burga, a stout orc matron if ever there was one spoke up. In her bed mokh. She won't say what happened, but she has been quite roughly handled. Crom did not like the sound of that but he merely nodded and walked into the small room that Zala slept in. She had been roughly treated. Her cheek was cut and her eye swollen nearly shut, she was covered in filth and tearstains streaked her face. She sat up when he walked in and started to cry again. He leaned his axe against her wall and sat down beside her bed. He gently touched her arm in an attempt to comfort her and she withdrew as if struck. This did not bode well, and so he spoke instead. "What happened Zala? Remember it is a great sin to lie to a Mokh. Whatever it is, the shame is not yours, but on whomever did this to you." Zala tried to pull herself together and looked down at the floor. Her voice was weak and thin, full of pain and shame. She burst into fresh tears and threw herself into his arms. He held her a moment, trying to comfort her. "No child, you have not shamed your family. This man has shamed his. Do you know who he was?" She nodded, still clutching him close. Crom's blood ran cold with fury. The Adelberts were a powerful and respected merchant family, and to hear that their son had presented himself so nicely only to harm a young girl filled him with a rage had known for years. "I swear by Ralaeth he will be brought to justice. Now let me tend to your wounds." Zala nodded and let him go, wiping her face gingerly. He gave her a warm smile and spent the next hour talking to her gently, telling her jokes, and tending to her wounds. He brewed her a potion to ensure she would not become pregnant, with specific instructions to drink one dose now, one dose at dawn, and another at noon. When this was done he gave her another another potion to ease her into sleep, before leaving her side and going out to see her family. Her father and three brothers had all armed themselves, old iron axes and swords, that had clearly not seen much use in sometime, spots of rust and nicks on the edges. Her father, Thok, was a good man, and he and his wife had been raised in the tribes. Their children, however, were all city born, and not a one had ever seen battle. Thok approached him, his anger and pain evident in his brown eyes. Did she say what happened? Who did it? I will have blood!" Crom spoke calmly, in a measured tone. Rash words lead to rash actions. "Aye, she did. She was raped, by Marius Adelbert." Thok howled with rage, his sons adding their own words of anger and bloody oaths of vengeance. Crom let them vent, but when they turned to leave he spoke calmly. "Thok, you will stay here with your family." Thok looked as if he had been struck. He was confused and angry and seemed unsure if he was hearing correctly. My daughter has been raped and beaten, and you expect me to do nothing? Have you lost your mind? "I have not. My friend, you were a great warrior in your day, but it has been twenty years since you fought a battle, and your sons have never. You rush off in a rage for vengeance, at least one of you will die, probably all of you, and even if you succeed in your vengeance, the humans will come to the quarter with fire and the sword, and there will be much blood and suffering before the end. We are not in a stronghold Thok, we must do things differently to survive in these lands." While he spoke, Crom maneuvered himself to the door. His words were true, but Thok's instinct as a father warred with his sense. Stand aside Crom, honor demands this. I will go through you if I must." Crom calmly placed his axe against the wall and folded up his sleeves, dropping his bag to the floor and pushing it aside with his foot. "If you feel you must." Thok seemed unsure, but roared and swung his axe wildly. Crom calmly stepped forward and caught the haft on his left forearm, before lashing with a titanic blow to Thok's jaw. 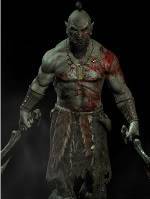 The older orc sprawled out on the floor, dropping the axe. Crom stepped forward and kicked the axe away, then smiled down at him and offered his hand. "I know you want vengeance. I know your blood screams for it, mine does as well, but we are not on the tundra anymore, this is not our land, and we must play by their rules if we can." Thok, still rubbing his jaw, accepted the hand and rose from the floor. Crom dusted him off, and put his hand on his shoulder. "Be with your family, see to your daughter. I will go to the city fathers and justice will be done. I gave Zala my oath to Ralaeth on it. Trust me old friend. I will not let our people be misused." Thok nodded, relenting and motioned to his boys to drop their weapons, and Burga stepped up to talk. She had a cooler head than her husband, though her pain was even more evident. Thank you Mokh Crom, for everything you do for us all. "You are welcome. At dawn, make sure Zala is awake and takes her potion." I will Mokh. Ralaeth bless you. *The elf and orc pair arrived from the southern terrain of Alaria to the stone-paved streets of the city. A gaggle of human children ran past the Silbaran's legs, playing their simple games with the joy of the unburdened. A heavy-set woman leaned out of a second-story window as she fanned the dust out of an old carpet, and a number of men slapped one another's backs, obviously headed to a local watering hole after a hard day's work. "Should we get a room at the Inn, first? A branch of my order can be found at the Hall, but there is no real hurry." You may take a room at the inn, I will be staying in the orc quarter. We are not entirely comfortable in the accommodations of the other races. "Well, let's get this over with, then. Take me to your people." Members of my clan have a presence here, we can get supplies and possibly a horse for you. I can run along side. Will there be any problem with being surrounded my orcs? "What do you take me for? They won't bother me if I don't bother them. You really needn't go to so much trouble for me, though. There's no need for you to stick around once we're done, here." This is where my clan gathers. They likely already know I have arrived. I will stay with you for your journey as I wish to assist you against Quetzaya, and I have no better plans. Now come, we should go in. You will be given some traveling rations and a horse, I will travel with you. He has also extended an offer of hospitality for you in the orc quarter if you are in my company. Not as comfortable as your inn. *The gutteral mutterings fell silent as Isis slid past the cloth that served as a door. Orc heads turned, and tusked mouths moved as they murmured quietly from pointed ear to pointed ear. Rather than look away, Isis met each pair of eyes solidly. Though none were terribly intimidated by the small little elf, neither did they seem to challenge her presence. "Why not. Please convey my gratitude and acceptance, and my own offer of my home in Lyramor to his people should the favor ever be needed." "We should speak to my own Order about the news of Stonedale. Did your elder have anything unusual to report?" The elder told me tensions run high in the north. Conflict between orc settlements and those loyal to Quetsaya is becoming more common. Tensions are high here as well, some crime has my people uneasy. We should speak to your order and move on. "...We should investigate that further. Let's go." *Large black paws delicately settled on the gable of a rooftop as Ravin landed, giving his wings a break. The hackles on the back of his neck rose slightly and a soft growl rumbled in his throat. Where in Ark's name were they? He knew he had smelled a forest nearby but the scents of this biped warren confused him. And he wasn't quite sure which direction it lay in. He sat on his hind legs and stood up, turning his head this way and that. All the noise... the scents... By the great Ark, it was so bloody confusing!